Rhythmic waves, high dunes, an ancient maritime forest, historic landmarks, and glimpses of wildlife are all common scenes at Fire Island National Seashore. Far from the pressures of nearby big-city life, Fire Island’s dynamic barrier island beaches offer opportunities for solitude, camaraderie, and spiritual renewal. The sound of the surf, the smell of salt air, the warmth of the sun, and the sight of miles of undeveloped but ever-changing dunes and shoreline are among the restorative elements that make Fire Island a special place. 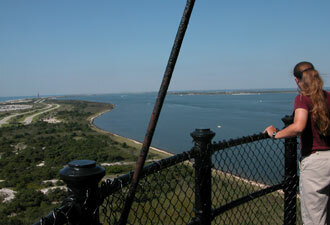 But Fire Island National Seashore is more than just a day at the beach. This national park includes New York’s tallest lighthouse, the home of a signer of the Declaration of Independence, and a federally designated wilderness area. Fire Island also includes 17 private communities that existed before the establishment of the park in 1964, each with its own distinct character, some with facilities and services for visitors. Most of the park’s island-based facilities are accessible seasonally by private boat or passenger ferry from Bay Shore, Sayville, or Patchogue, New York. There’s easy access to the ferries via the Long Island Railroad from New York City and JFK Airport. See Plan Your Visit. The ferry from Sayville connects to one of Fire Island’s favorite destinations: Sailors Haven with its lifeguarded beach and cozy marina, and the Sunken Forest, a globally rare maritime holly forest. Take the ranger-guided tour to learn more about this 300-year-old forest of American holly, sassafras, and shadbush trees that survive behind the protection of a well-developed secondary dune system. Fire Island, like all barrier islands, is constantly changing and always on the move, so it is quite remarkable that this habitat has remained stable for hundreds of years. The ferry from Patchogue to Watch Hill takes you to a bustling marina, walk-in campground, and a quiet lifeguarded beach. Here, the Salt Marsh Nature Trail meanders through a well-developed bayside marsh and is a good place for watching birds, but watch for mosquitoes, too. You can take a two-hour ranger-guided canoe tour during the summer. Both Sailors Haven/Sunken Forest and Watch Hill are good locations to study a cross section of natural barrier island habitats. Fire Island is home to a variety of terrestrial and aquatic wildlife. Parts of Fire Island are open all year and are accessible by car. Don’t miss the Fire Island Lighthouse on the western end of Fire Island, where you can enjoy exhibits about the island’s maritime heritage, see the original first order Fresnel lens, and climb the 182-step tower for a panoramic view of Fire Island. Back to the mainland and about an hour’s drive to the east, the Fire Island Wilderness Visitor Center serves as your gateway to the Otis Pike Fire Island High Dune Wilderness. On mainland Long Island, plan to spend a couple of hours at the 613-acre William Floyd Estate, birthplace and home of a patriot who dared to sign the Declaration of Independence in 1776. Occupied and expanded by members of the Floyd family from 1724-1975, the Old Mastic House reflects a continuum of use and change over almost three centuries. The house is open for tours from Memorial Day to mid-November, but special grounds walks are offered throughout the year. With more than 75 percent of Fire Island National Seashore’s 19,580 acres being the waters of the Great South Bay and the Atlantic Ocean, it is no surprise that boating, swimming, sunbathing and beachcombing are popular things to do in the park. Park rangers and volunteers lead guided walks, talks, Junior Ranger workshops, and other interpretive programs. For lodging, you can stay overnight on your boat or in the campground, but the park has no cabins or motels. 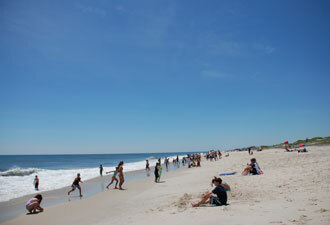 Accommodations are available locally in a few of Fire Island’s communities and on Long Island. During the summer, water taxis can provide shuttles between the communities and park facilities, from the Fire Island Lighthouse to Watch Hill. 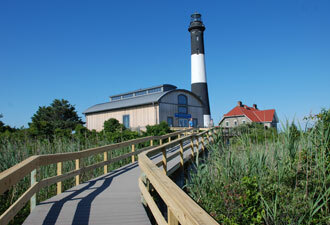 Fire Island National Seashore provides a wide array of amenities, activities, and ambiance throughout the year. Plan your getaway to experience the national seashore in all its seasons.